I am SO sad over David Bowie’s passing, how can the earth not grieve the loss of living stardust? We all felt him beam away. the eye of the venomous serpent near the center of the Galaxy. SO FIRST of all David Bowie’s VENUS is located at 2 degrees Sagittarius which is WHERE Venus was at the start of 2016 and what I had spent all that time writing about. The wrestling match of poisons point in heaven. The arrow’s piercing deadly medicine. Second of all, David Bowie had Juno located at 11 degrees Sagittarius (that asterix looking thing with the cross under it). Juno is HERA. and at the time of Bowie’s death as you can see shown in green on the outer ring near the top in the image above, both Saturn and Venus sit exactly conjunct his HERA in this location, the center of the labrynth, the eye of the Dragon, the OLD POLE STAR OF THE EGYPTIANS that aligns with many of their temples. In the information from my blog on Hercules it states that HERA is like POISON AIR or poisonous oxygen, or really HOSTILITY IN THE AIR . HERA a source of poison for Hercules, and here David Bowie had a dose of poison too much for him to deal with at the culmination of this point in the form of toxicity from Liver cancer. 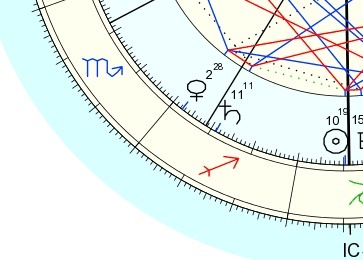 Also note in the image above the Sun, the Moon and PLUTO all CONJUNCT or are piled on top of his Sun there in Capricorn. 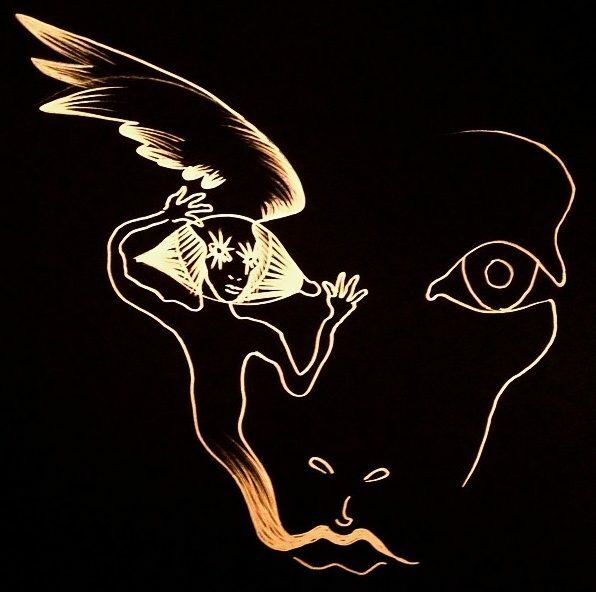 Pluto is the lord of the Underworld, for Bowie to pass RIGHT when Pluto conjuncted his Sun is as if the Grim Reaper himself came to collect him!! 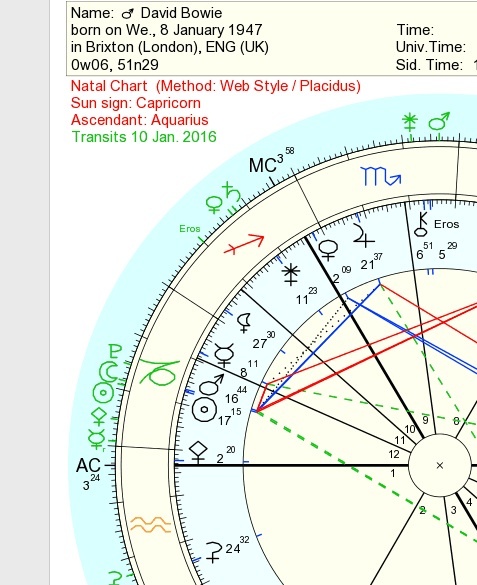 The other amazing correspondence is if you look at Transiting Hera (Juno asteroid) is located right abve Chiron in his chart. His Chiron is in SCORPIO, of course, more venom. For those of you nerds out there, you might know that CHIRON was a centaur (like Sagittarius) who was POISONED by the ARROW OF HERCULES. So how about those archeytpes for ya? Looks like David managed to Ascend right through the center of the galaxy, a straight arrow shot through the pupil of the great snake. May our ears and eyes drink deeply of your poison forever. Now I know, that is a very aggressive word. Might seem kinda, negative or whatever, but listen just a second. Because Poison is in fact the PERFECT word. I arrived at this word due to narcissism (its own special kind of poison ). I looked at the chart for 2016, and the first spot I looked at was the Sagittarius area of the sky for no other reason than of course, I am Sagittarius, so that’s annoying, sure. and one is due to the location of Saturn at 11 degrees Sagittarius at the start of 2016.
and 11 degrees is the location of my north node, said to be a persons purpose or reason for incarnation in astrological circles. at two degrees Sagittarius we find ourselves at the star at the tip of a poisoned Arrow being held by the Centaur. It’s the poison coating or substance on the arrow about to be shot into the heart of the scorpion. 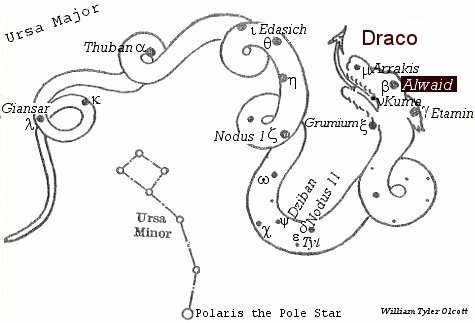 The Second spot in the chart at 11 degrees Sagittarius is the eye of the poisonous serpent or dragon. It is a venomous eye that eminates outwards when you gaze upon it like the basilisk or evil eye. We can start with the first point, Venus at 2 degrees and the idea of the poison arrow. So I kept looking into it. 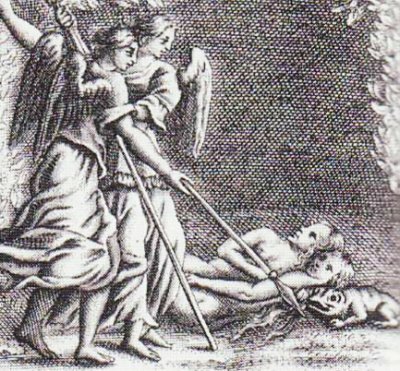 1660s, from French toxique and directly from Late Latin toxicus “poisoned,” from Latin toxicum “poison,” from Greek toxikon (pharmakon) “(poison) for use on arrows,” from toxikon, neuter of toxikos “pertaining to arrows or archery,” and thus to a bow, from toxon “bow,” probably from a Scythian word that also was borrowed into Latin as taxus “yew.” Watkins suggests a possible source in Iranian taxša- “bow,” from PIE *tekw- “to run, flee.” As a noun from 1890. If we look at the constellations of Sagittarius and Scorpio, we see that the Sag is shooting a poison arrow at the Heart of the Scorpion (ANTARES) while the Scorpion Stings the sag on its Ankle, in some kind of like “Venom hug” or something. Its venomous prick against venomous prick and may the best prick win. 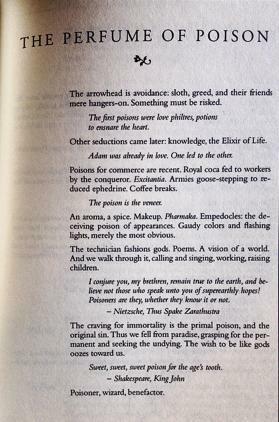 at the heart of the teaching of GU POISON ( https://en.wikipedia.org/wiki/Gu_(poison) is a concept from Chinese Shamanic practices that there is like a pit or container, something sealed that you can shut, and inside this container, you throw one each of five venomous toxic creatures (perhaps metaphors for our emotions). The specific creatures have a few variations but tend to be like a scorpion, a centipede , a toad, a spider and a snake. Then they all fight it out. like a silk worm kind of? Also and very important to the GU POISON story is that all of the above mentioned creatures, including the silk worm are actually forms of medicine in Chinese Herbal studies . Very powerful Medicines in fact. The term snake oil salesman may have originated form these medicines which ironically enough REALLY DO WORK ( http://www.economist.com/news/science-and-technology/21569015-snake-venom-being-used-cure-rather-kill-toxic-medicine ), there is nothing fake about the medicinal properties of snake venom, and nothing safe about them either, collecting snake venom (for antidotes for bites –>which of course means you actually use the poison itself as part of the cure<–) is a profession in the highest death risk category. This is the key of poison. This makes it seem, like poison is good for you, or MAKES YOU STRONGER. It is actually scientifically true, that poison CAN make you stronger. If you don’t believe me, go ask antibiotic resistant bacteria. They are pretty invincible and all because they were able to not die when confronted with a poison, antibiotics. So in terms of becoming a super duper un-killable thing, there is a missing ingredient. In an example of a human being trying to be like the golden worm mentioned above we need look no further than the case of Mithradates VI Eupator of Pontus in the first century bc. If you aren’t familiar with the name, perhaps you have heard of Mithradate, the famous antidote and cure-all named in his honor. Mithradates spent several years living alone in the forest ingesting poisons according to legend. He did this in order that he would become immune to all poisons, this is an ancient practice predating him of course. His strategy, that of placing inside of him everything we are ever told to avoid upon threat of death, worked very well to stave off death, if the story is true. But what is Poison exactly? What does that mean? When most people think about poison you think about ew, oh no, gross, or deadly toxic something generally that is very ver BAD and must be avoided at all cost, the cost of life itself. The word poison itself VERY weirdly means “to give a gift”. Like to “give something to” and is related to virus, which you can literally give to people. mid-13c. “that which is given” (c. 1100 in surnames), from a Scandinavian source such as Old Norse gift, gipt “gift; good luck,” from Proto-Germanic *giftiz (cognates: Old Saxon gift, Old Frisian jefte, Middle Dutch ghifte “gift,” German Mitgift “dowry”), from PIE root *ghabh- “to give or receive” (see habit). For German Gift, Dutch, Danish, Swedish gift “poison,” see poison (n.). It is strange to have such a negative word attributed with such a positive word. It gets extra weird because if you go back and read that GU POISON page from wikipedia I posted it says in there that GU POISON can be GIVEN to someone else (?!) on purpose. We find another word interrelated, DOSE. The word dose is specific to the concept of a Dr. giving a dose of medicine, so like to give here is like to give medicine, but also somehow, to give poison. so poison and medicine are taking a similar meaning. From these we can surmise that a poison is passed from one thing to another for the purpose of coming into confrontation with something else (that something could be you) in a present moment. The face to face part makes it pretty confrontational, like you have to look in its eyes. like a boxing match. Or like a chess match. like the venomous creatures pitted against each other. Gladiators. Poison is something introduced to you, given to you from the outside, and it enters your inside and you have to wrestle with it until the two of you come to an agreement, or stasis and then either you win and kick out the poison, the poison wins and you die, you can GIVE it to someone else, or you and the poison both just hang out together. The more agreeable your body is to outside things coming in, you could maybe take anything and be cool. But it all depends on how FONZ you really are. The other thing that seems worth mentioning, is that it takes time to develop this inner Fonz, and it has to get use to these poisons over years and bit by bit, one by one. The difference between poison and cure is dose. The names of the star sitting at 11 degrees sagittarius where Saturn starts the year are Rastaban and Alwaid. It bears mentioning that this star, at one point was in fact the pole star. They estimate Alwaid was the pole star around 3500 bc, and the Egyptian temples of Karnak were oriented towards it. This dragon, you see, is in the CENTER of our sky. in the middle of the whole circle of the procession of the zodiac. Think about a may pole, you know the ones with all the streamers coming down from them and everyone dances in a circle. and one star is the one in the middle that everything else is going around. In fact the point known as the exact Center of the Galaxy (the Galactic Center) is at around 26 degrees Sagittarius, not very far away, and close to another star in the constellation of Draco. Now I stopped a minute and thought about that name, Alwaid. That seems to me to mean this draco snake was a loser in the poison battle, and was in fact destroyed by something else. Some golden worm got it. Upon further inspection I found out that the head of Draco in the sky is sometimes placed under the HEEL of the hercules constellation, like Hercules is stepping on it. Destroying it. He is the golden worm. 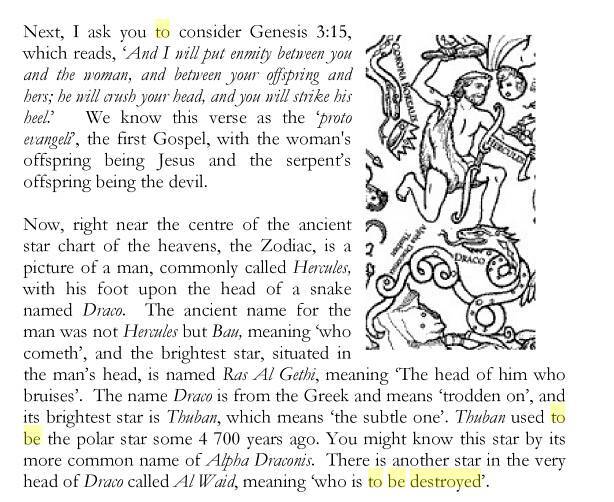 This image of stepping on the head of a serpent is of course, all over the place in the bible. It is here we start to get an idea of what exactly the nature of this poison is that we are talking about here. We each have to defeat the poison of our deceiver, and get into the CENTER of our minds, the labyrinths, where the big snake is hiding and stomp right on its eyeball. To do this we must use the poison as its own cure, use our minds to defeat our minds. The PRESENT MOMENT is the gift we are given to defeat the poison of the mind deceiver. we have to lock ourselves in a room with all our venomous wrestlers and face ourselves. Draco is the the voice of doubt inside your ear. Now before this starts getting too christian for you guys, I’ll go ahead and max out on the christian/Jewish stuff right now and give you your dose of it all at once. the other thing that happened was I watched the movie room 237 about the shining and how it talks about the LABYRINTH symbolism in the movie The Shining by Stanley Kubrick in which of course a man goes crazy hears voices and tries to murder his family, just like hercules mentioned above. There is also an oxygen connection in that the hotel is at high altitude or low oxygen which somehow makes people go crazy and kill themselves). So what happened is, Hercules is influenced by his environment, what is outside of him (the thin air?) is influencing his thoughts and actions. Giving him “ideas”. That movie articulated this idea I am talking about right now so well (towards the end), it is highly worth watching. Something in both of these examples, Hercules & The Shining, is influencing the mind to do destructive things that aren’t necessary. This is a venom. This is a poison. This is deceiver. An illusion. Mind poison. The eye of Draco is the center of the poisonous source of destruction we all hold within us and the capacity to fight to the death to protect ourselves (our lizard or reptile mind which is Draco). dont freak out about poison, its the thing at the center of everything. We are surrounded by poisons. They seep into us with every breath. Get used to it. We must work with time (Saturn) to build our resistance and immunity to them. We must not react to them. We must get Fonz. Try to build immunities to your own negative reactions and ideas (which might not even be yours as in the case of Hercules someone or thing might be GIVING them to you), these are filling your body with all kinds of toxic venoms. Quit giving your poisons to everyone else, keep them in your own container until the best one wins. 2016 is a year when we have to carefully observe all the voices and commands we are hearing in our ears and focus very keenly on taking their venom in small doses that we may become immune to the toxic productions of our thoughts regarding data and information that our senses deliver to us. Recognize that serpent eye looking at everything, judging everything and disregard ALL of its OPINIONS. I am hoping that SATURN seated here upon the dragon eye as we begin 2016 is an indicator that many of us will be able to SEE this toxic outpouring of poison at the source of it. I am hoping that Venus located at the poison arrow tip will administer whatever medicine we need, as humanity, to be able to think when the times get tough of something other than the worst case scenario, and that we need to just kill everything in order to live. Confusion could just get so rampant, we won’t be able to miss it for what it is. May we each become a golden worm this year. What is the best hair of the dog to take in 2016 for the cure to the poisoned mind?